I really enjoy making homemade crackers. The process is easy and similar to making cookies. They're perfect for those moments when you want to bake, but need to chill with all the sugar you've been eating. These Savory Whole Grain Pumpkin Crackers are crunchy, salty, and filling in that wonderful whole grain-ey way, and they don't taste like pumpkin at all. This may not seem like a feature, but for my pumpkin averse husband (I KNOW) it's a really good thing. I added pumpkin because 1) extra fiber is always fun and 2) I often have a little pumpkin puree left over from other pumpkin projects. This recipe is perfect for using up that last little bit. Real quick though, are you aware that Halloween is 11 days away? The child in me says that's forever, but the grownup in me knows that it will be here soon. So far I have no costume, most of my Halloweeny foods have yet to be made, and I've only watched one Halloween movie. One! Like, who is this person, and what did they do with the real me? You know what though? It's fine. It's fine because I have my FAL (Fall Aspirations List), and a plan that I've already started implementing. Some recipes have been made, one movie has been watched, and my husband and I have narrowed our couple's costume down to two finalists. It's all coming together, and the process is a blast. 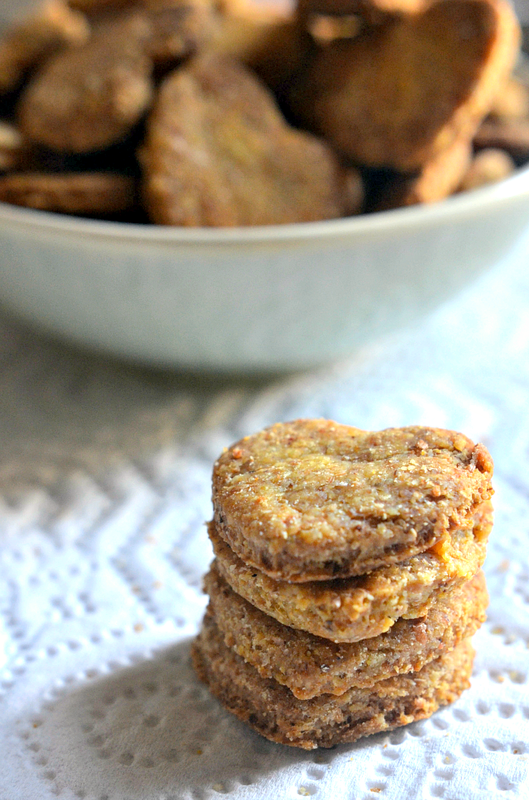 These crackers weren't on my FAL, but I had a small amount of pumpkin leftover from my Pumpkin Spice Oatmeal Cookie Sandwiches, and I wanted to use it up in something worthy. Crackers are always worthy! 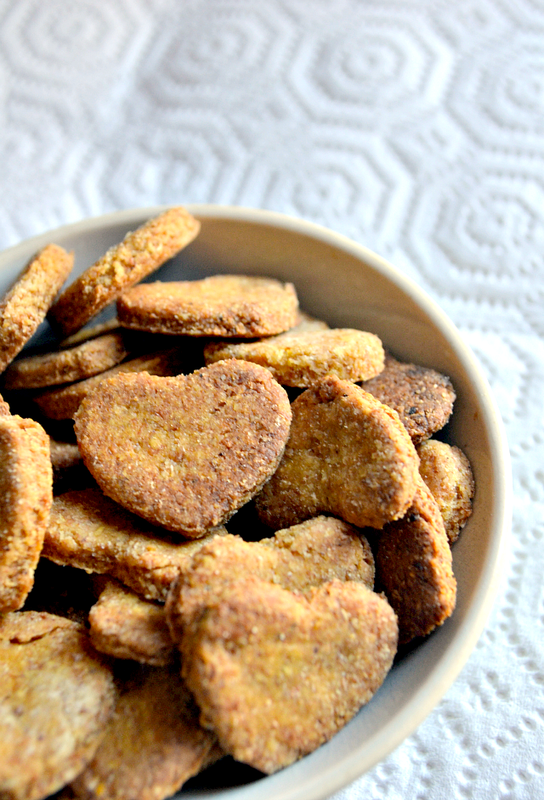 If you've never made crackers, don't fret. They're really easy and very tasty. 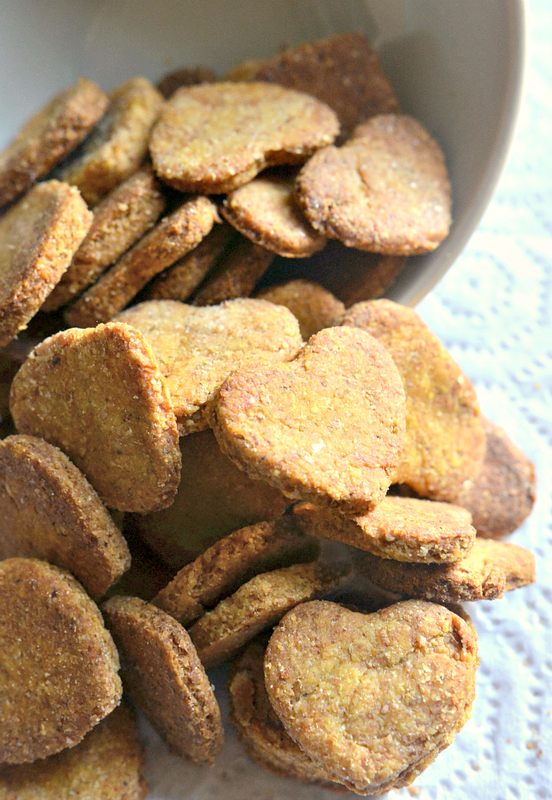 For these Savory Whole Grain Pumpkin Crackers I used whole wheat flour and whole grain cornmeal for a rustic and hearty snack cracker. If you want them to be truly whole grain make sure to use whole grain cornmeal as opposed to plain cornmeal. To be honest, I think they'd taste just as good with plain cornmeal, but if you're a stickler for whole grains then make sure you use the correct meal. 1. Preheat the oven to 350°F, and line a baking sheet with parchment paper or a silicone baking mat. In a small bowl combine the pumpkin puree and the water. Set this aside. 2. In a large mixing bowl combine the whole wheat flour, cornmeal, salt, smoked paprika, onion powder, black pepper, and garlic powder. 3. Cut the margarine into the flour mixture using a pastry cutter or your fingers. Keep cutting it in until the ingredients are thoroughly combined and the mixture is crumbly. 4. Add the pumpkin-water mixture to the flour-margarine mixture, and use a spatula to combine. It'll be crumbly, but should come together into a ball just fine. If it doesn't, add a little more water to pull the dough together. 5. Transfer the cracker dough to a floured surface, and roll it out to an 1/8 inch thick. Cut out your desired shapes, and place them onto the prepared baking sheet. Sprinkle a little bit of salt onto the tops of the crackers before placing them in the oven to bake for 12-15 minutes, or until they're golden around the edges. 6. Allow the crackers to cool completely before serving or storing them. You can store them in an airtight container at room temperature for up to a week. For more fun fall recipes check out my ebook, House Vegan: Fall FoMo No More. You can read the first chapter for free!